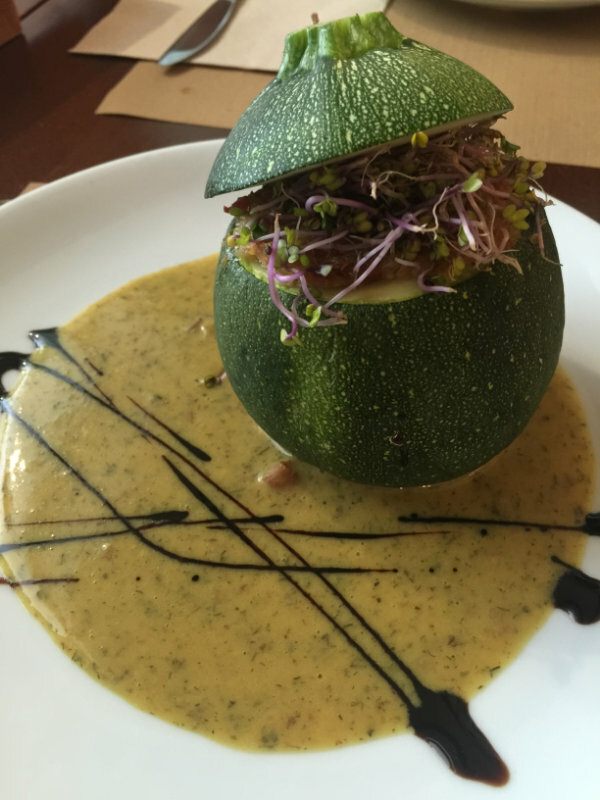 Are you vegan or vegetarian and heading to Barcelona? Wondering what food you will find? 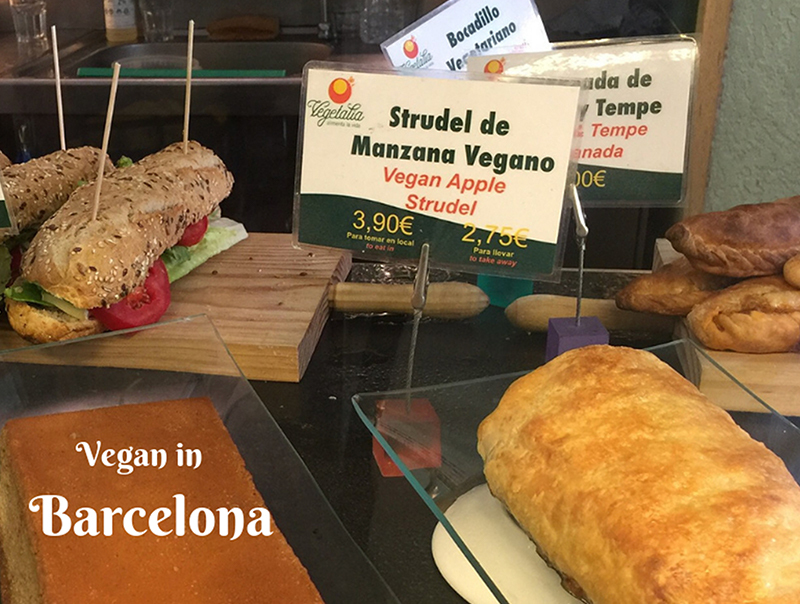 Being a vegan in Barcelona is quite easy if you know where to look. 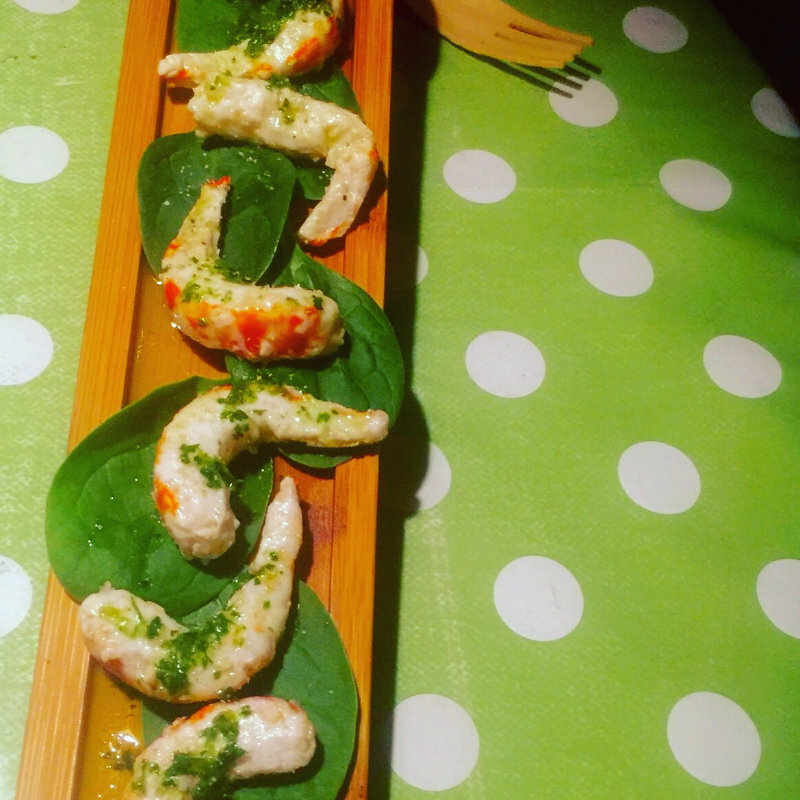 Despite being known for its jamon (ham) we found amazing food, full of flavour and presented in a modern, funky way. We ate out mostly for breakfast and dinners, with lunch being a homemade salad roll that we took on or adventures. 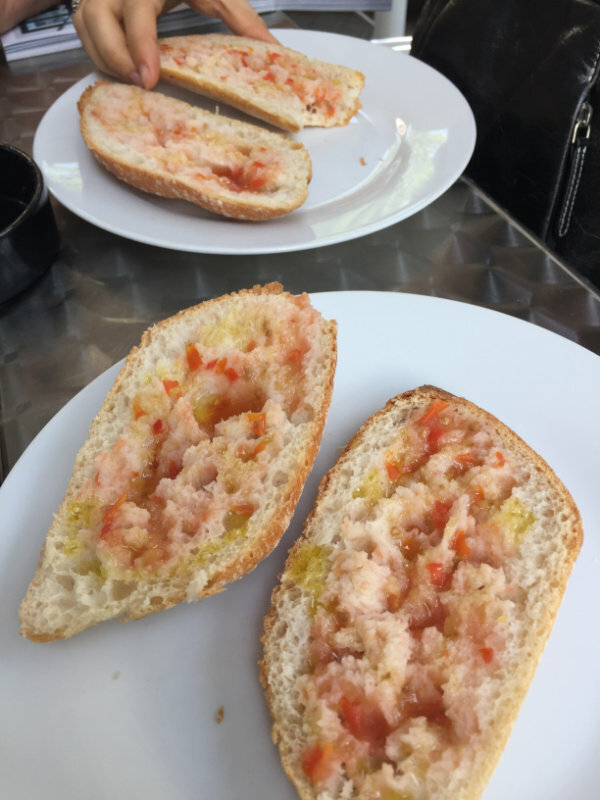 A regular breakfast for us was pan con tomate – bread with tomato – which came with olive oil and a smear of tomato purée, and a soy cortado. The word ‘leche’ is Spanish for milk, so we got use to asking for un cafe con leche de soja. 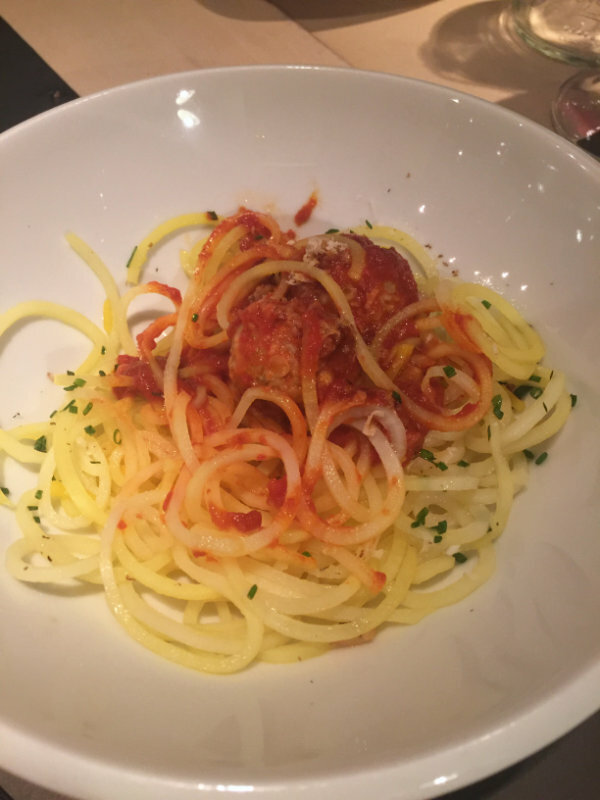 Here are 6 restaurants I visited that I would return to again next time I’m in Barcelona. This was a recommendation from our bike tour guide. It is a vegetarian restaurant frequented by locals, so you know it’s great. They offer a three course menu at lunchtime on Mondays to Fridays for €10.90. They have vegan dishes, options for vegans, gluten free dishes and options for gluten free all clearly stated on the menu. You can also ask for English menus if you need. 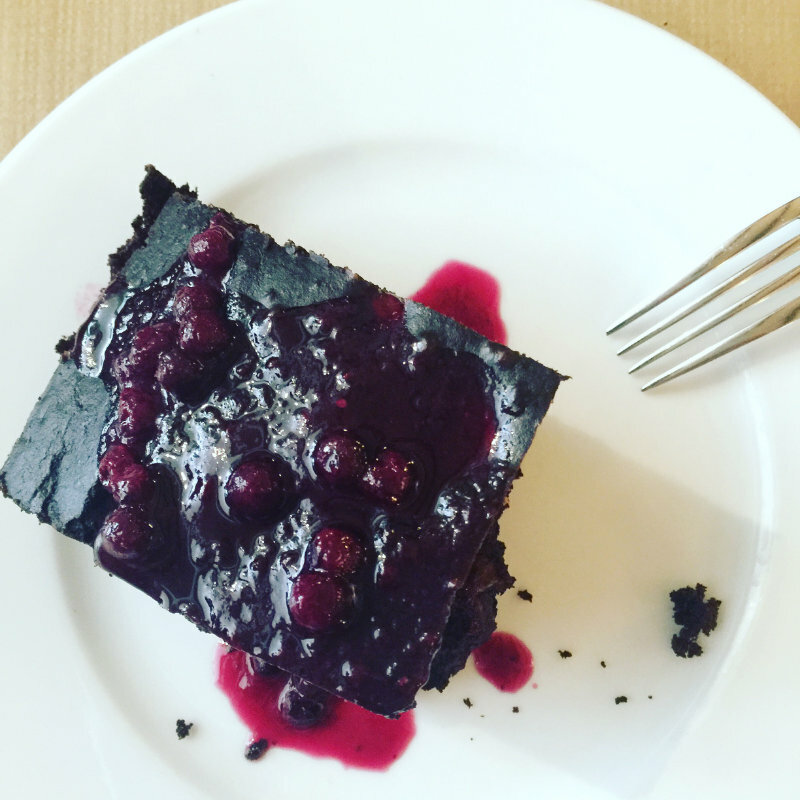 I had the hummus with lentils, stuffed courgette and a banana and cacao cake with blueberry sauce. 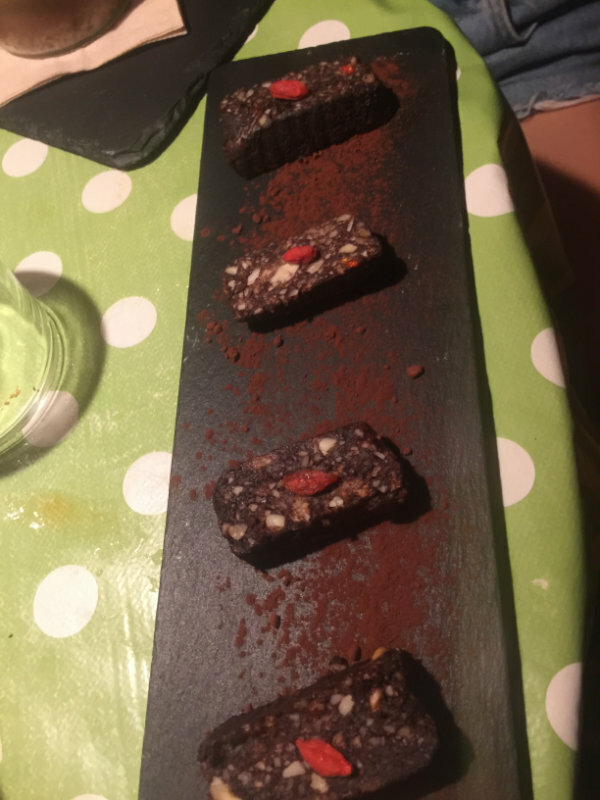 Other offerings included gazpacho, a salad bar, vegetable and seaweed rice and a seitan dish, with desserts of carob custard, smoothies and compotes. Most dishes are also sugar free. 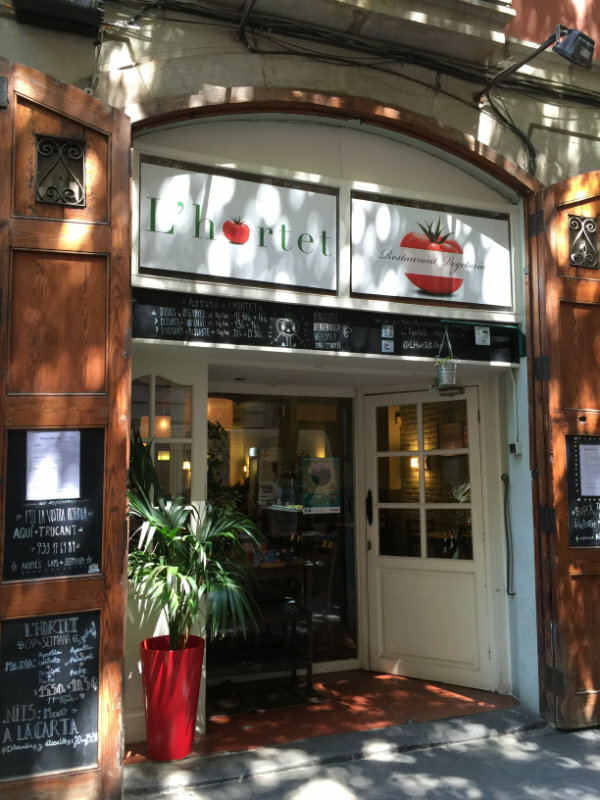 We went here twice – once for a full tapas meal, and once for a couple of tapas dishes to snack on before dinner. They also have a big menu of burgers, paella, raw desserts and sangria – what more could you want? Bar.Celoneta is located in the Barceloneta area, near the beach. It is a funky little place with lots of cool decorations to check out – like books hanging from the ceiling. We had olives, tempeh skewers, three different patatas bravas dishes, hummus, vegan prawns (OMG these were amazing! ), tirawmisu and a ‘brawnie’. 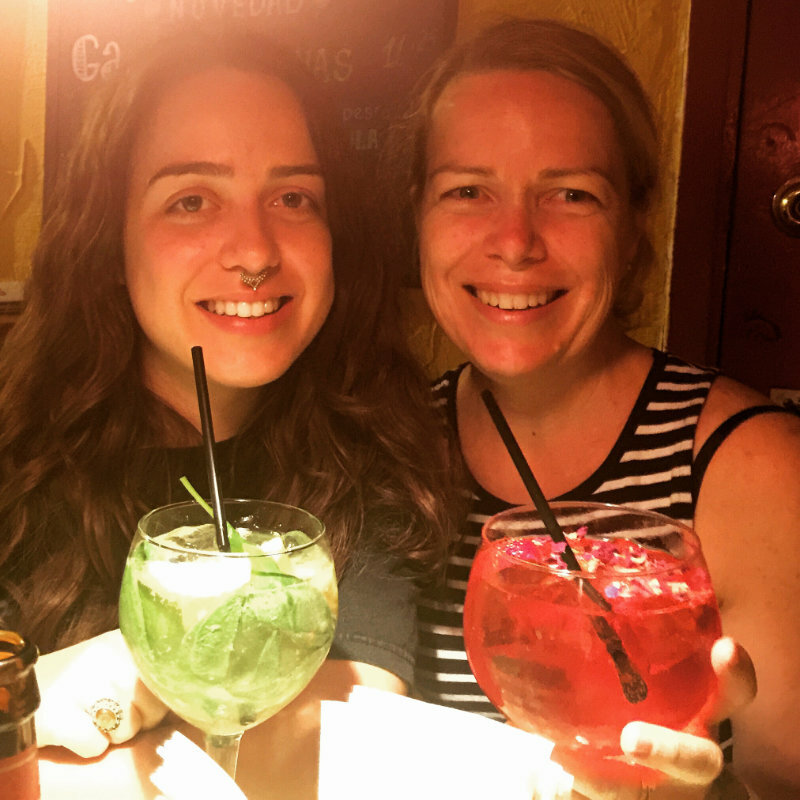 Our sangrias were the Jezebel – wine, ginger, chilli and basil; and the Cleopatra – cava, gin, rose petals and strawberries. Our first time here they was closed for holidays. On our second visit the street was alive with locals catching up over a drink. Like most restaurants in Barcelona, the place is small, so if you’re just heading there for a drink then hang around outside. It’s cooler and the vibe is casual and trendy. 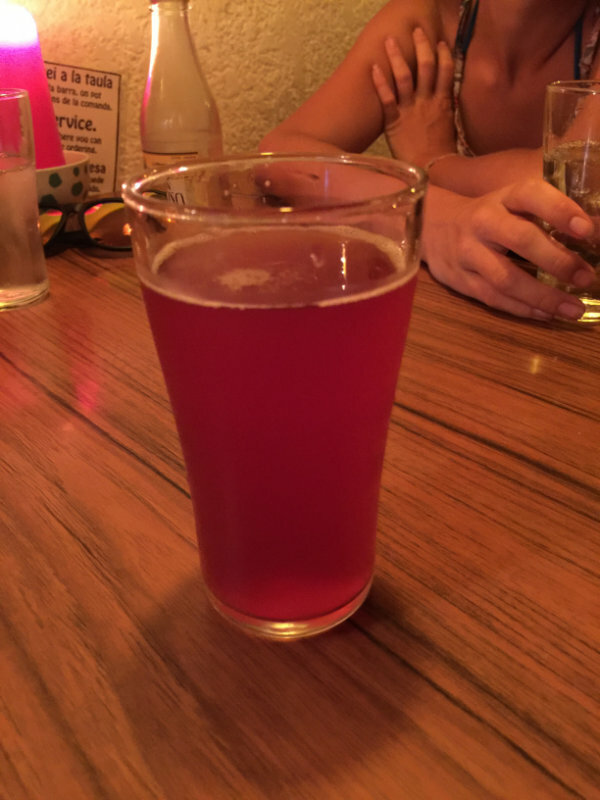 Here you could ‘probar la cerveza’ before ordering, so I sampled the ‘weird beer’ which was a mix of sangria and a local beer. Everyone thought it was weird, but I kinda liked it, so that was my drink of choice. 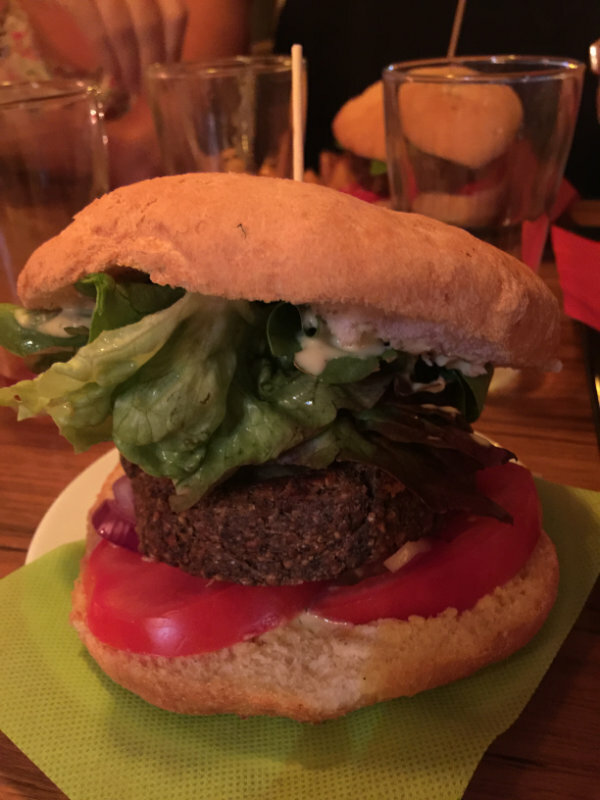 We all ate burgers – hemp burger, seed burger, Mexican burger and a black bean burger. They have a huge range of vegan beers and a couple of vegan ciders. 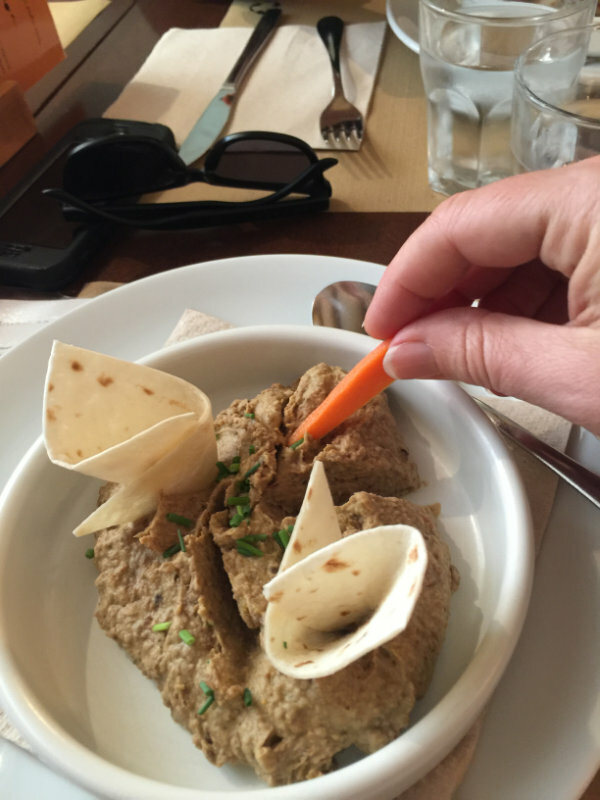 This is a great unpretentious, casual dining restaurant. There’s even a piano inside that you can play, if you know how. Our first lunch was at Vegetalia. 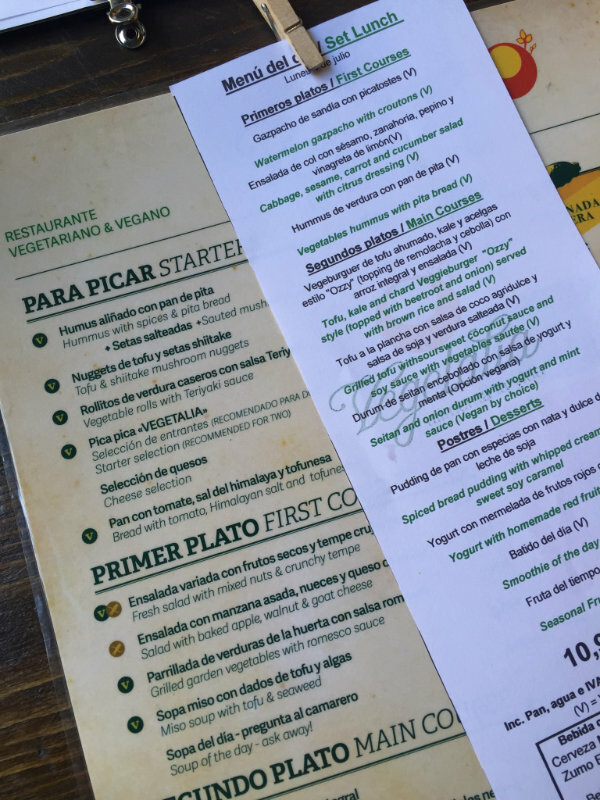 They have a three course special, which we found quite common in Barcelona, for €10.90. 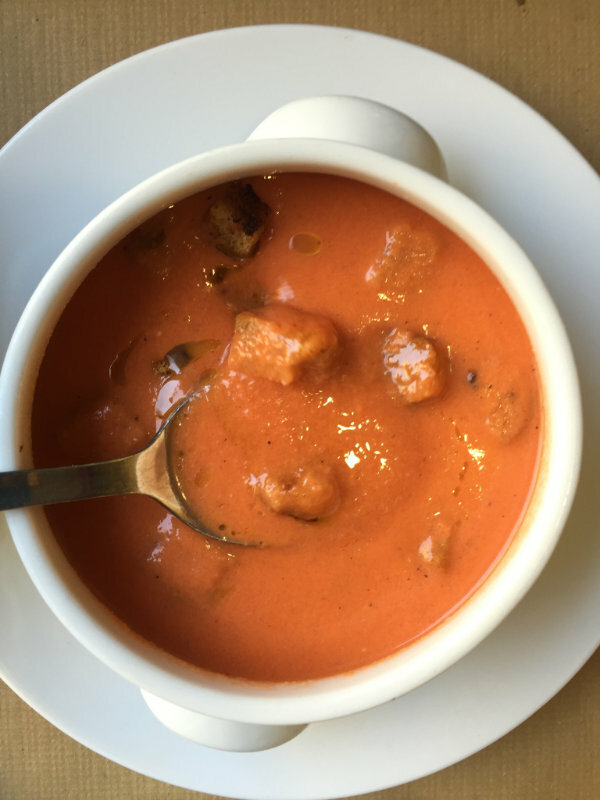 Choices include: hummus, watermelon gazpacho, salad, tofu and kale veggie burger, tofu with coconut sauce and vegetables, seitan with mint sauce, smoothies, sliced bread pudding and fruit. You can also get a variety of cakes and desserts at the counter such as strudel de manzana vegano. Teresa Carle has been a chef for over 35 years and has a number of food ventures in Barcelona. Teresa’s Stairway is a healthy fast food restaurant with many healthy options on the menu. 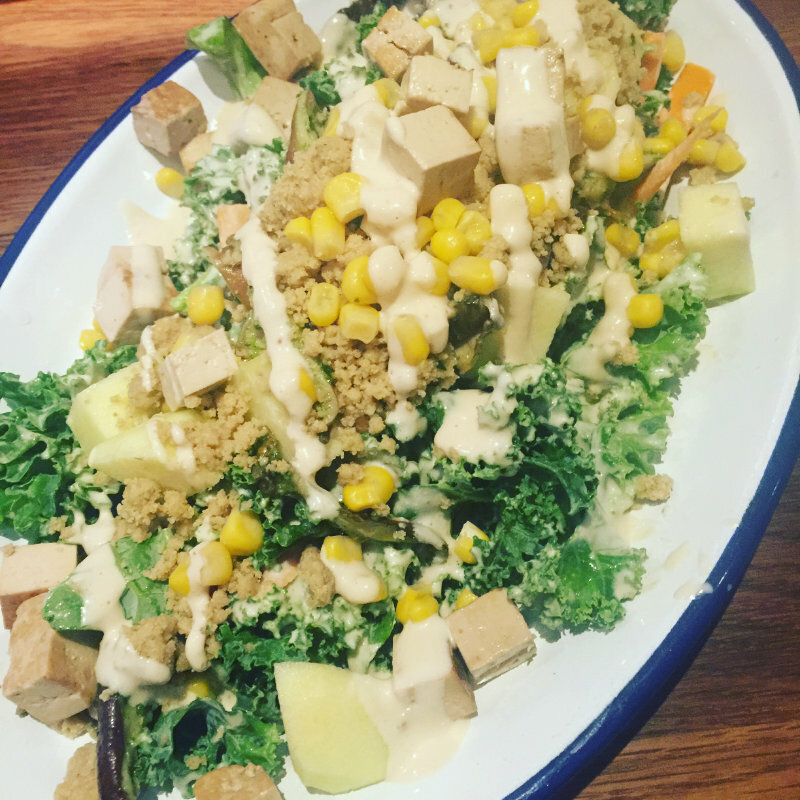 I had an incredible tofu Caesar salad. 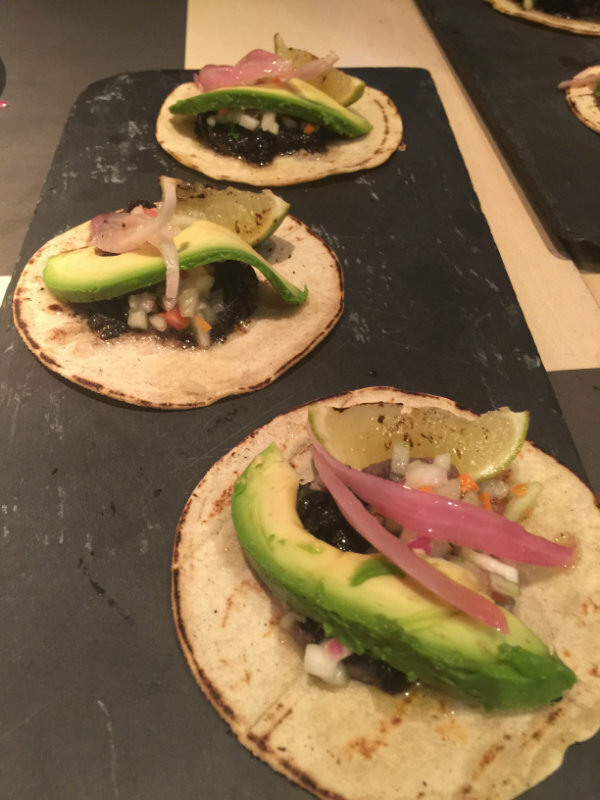 They also have soups, toasts, burgers and tacos. And the drinks are just as amazing. 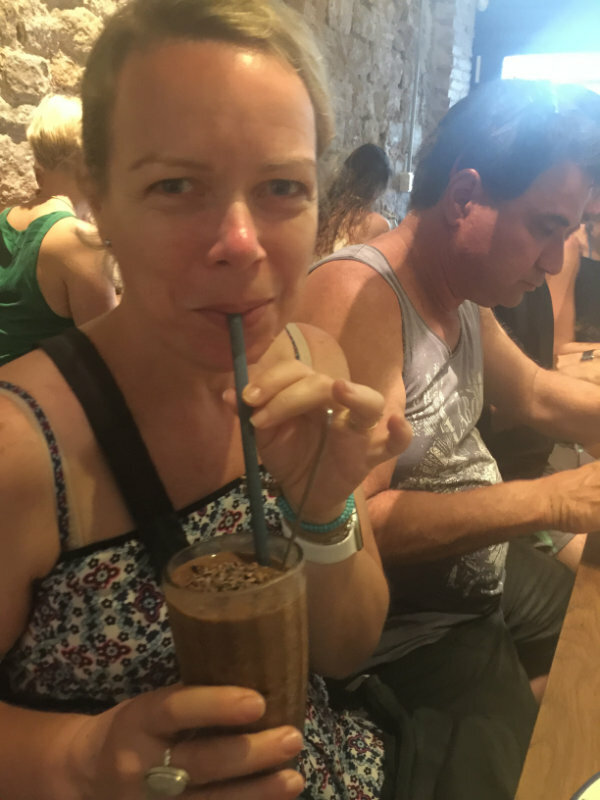 A healthy frappacino – a mocha – was on the menu for me, made with delicious plant based milks. Rasoterra has its manifesto on its website which lists, among other things: ‘because we believe that a good meal is a social experience that improves everyone’s quality of life’. 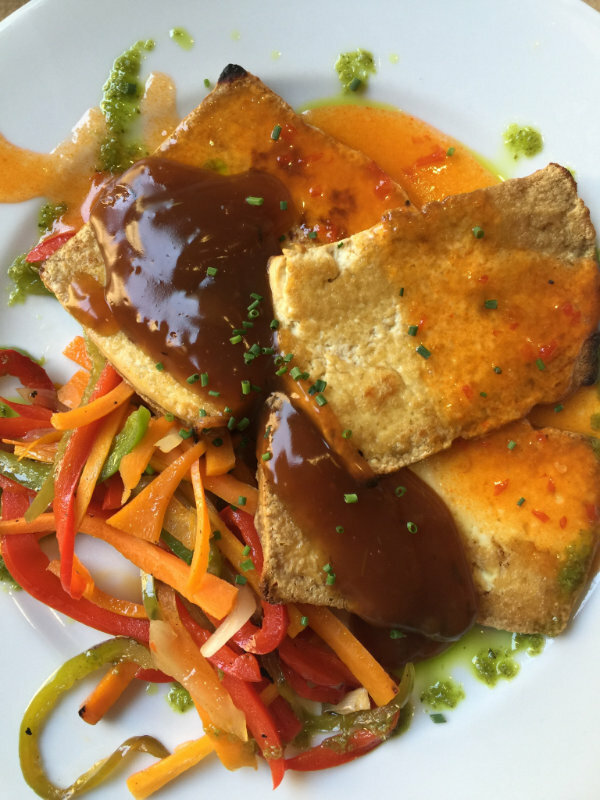 Rasoterra is a vegetarian and vegan bistrot certified as 0 miles by Slow Food. Many of our ingredients are local and/or organic. We either buy them directly from producers or grow them in our vegetable garden. Rasoterra was one of our favourites. It was more upmarket than the other places we went to and it had an extensive cocktail list including a black mojito. We ate olives, more patatas bravas, cerviche, gyozas, meatless spaghetti, tacos, fennel salad and finished it off with a crunchy, sweet apple crumble. 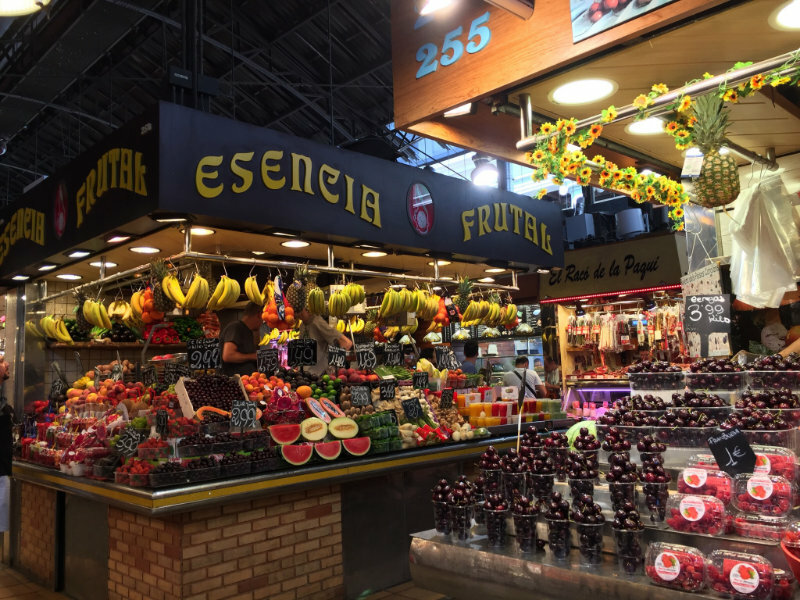 And of course, if you’re not going out to eat there is always markets, including the famous La Boqueria.